Another day, another cupcake. Am I right? It’s sure felt like that lately. Between birthdays and all of the hullabaloo (wow, what am I, 70?) surrounding the Seahawks these past couple weeks, I’ve been making a lot of cupcakes! For the big game, I made two different types: Beast Mode cupcakes with a fantastic recipe from Trophy Cupcakes, and Blue Moon Cupcakes. I thought beer and the Super Bowl went nicely together, and since our city has been celebrating “Blue Fridays” to show their spirit for the Seahawks, it seemed fitting to make a “Blue” cake. I started with a basic recipe from Brittany, Herself and altered it to make what you see here. Preheat the oven per the cake box instructions. Line 24 cupcake cups with wrappers. Place the cake mix, oil, eggs into a mixer. Look at the instructions on the cake box for water, but instead of water, use Blue Moon. (My recipe called for one cup.) Add the Blue Moon and orange extract to the mixer. Mix thoroughly. Fill the cupcake wrappers ⅔ full with the cupcake batter. Bake according to instructions on the back of the box, or until cupcakes are golden and a toothpick stuck in the middle comes out clean. Let cupcakes cool on a baking rack while you prepare the frosting. Place the butter in a mixer and mix until light, smooth, and fluffy. Add the powdered sugar, one cup at a time, mixing in between each cup. Using a spatula, scrape the sides and the mixer and mix again until butter and sugar are fully mixed. Add the Blue Moon, vanilla extract, orange extract, and a pinch of salt and slowly mix until incorporated. Mix at a higher speed for a couple minutes until frosting has an even consistency and appears light and fluffy. Add more Blue Moon or orange extract to taste, mix thoroughly. Using a large pastry tip, frost the cooled cupcakes. Top with sprinkles or the decoration of your choice. These look great and very fun! I might try to make them (if I can fine a gluten-free box mix/flour) and add some orange zest in the batter or on top of the blue icing. My husband loves blue moon so I know he would love these! Pinning! Liking the blue! Would have to adjust for gluten, wheat and grain free recipe. 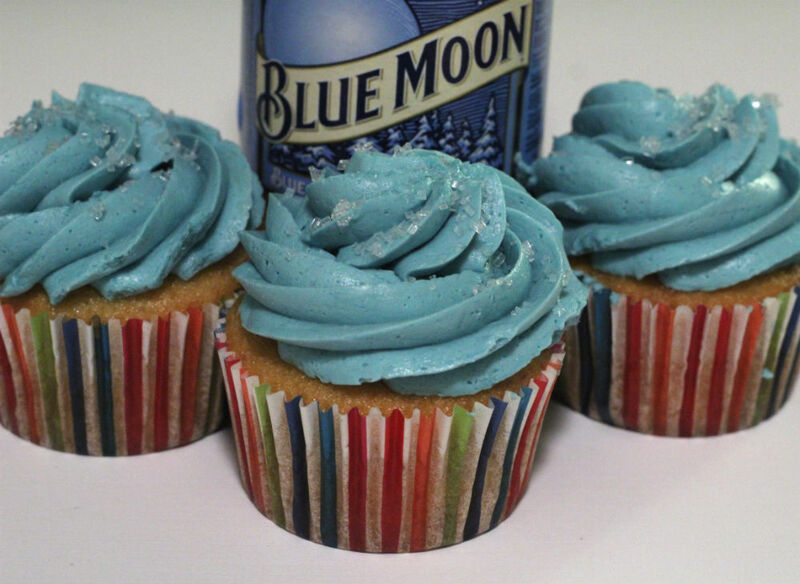 Ha, I never knew you could put beer in cupcakes. My husband would love this idea! Pinned. Most creative cupcake I have ever seen. I am so making this. Are you on pinterest? Bet this recipe would go crazy there. I need to apologize, because I’m sorry. How have I NOT been following you blog?!?! Please forgive me! My stomach just growled at me, not out of hunger, but anger at not learning these recipes.